Sun Devils Scorch UCLA in Tempe, 78-60. Tempe, AZ – The ASU basketball victory against UCLA today (78-60) was a signature win on many different levels. Not only did the team sweep the L.A. schools and improve to (16-4 / 5-2 Pac-12), but a statement win like today will add some credibility to their resume come tournament time. Yes, it’s now time to start considering the Sun Devils as a legitimate contender to make the NCAA tournament. Plenty of work still needs to be done, but this team has a chance. On a rainy day in Tempe, the Sun Devils had one of their biggest crowds of the season inside Wells Fargo Arena. The ASU fans that attended the game were treated to an exciting show of fast paced basketball, teamwork and intense effort by Sun Devil basketball. 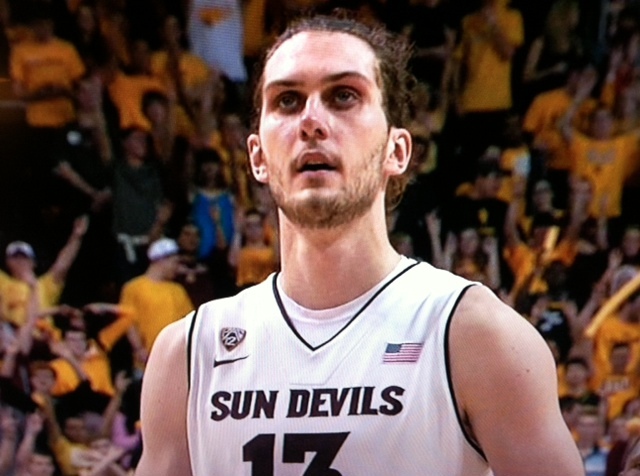 Jordan Bachynski led the Sun Devils with 22 points, 15 rebounds and 6 blocks. They also got to witness Jordan Bachynski dominate inside the paint all day. Bachynski finished with a team leading 22 points, 15 rebounds and 6 blocks. With those kind of numbers, ASU will be a force to be reckoned with moving forward. Senior Carrick Felix did his part by adding 23 points and 11 rebounds, and played his usual brand of solid defense. Jahii Carson (12 points / 8 assists) and Evan Gordon (12 points) handled the ball with poise and confidence, and Jonathan Gilling made a variety of plays throughout the game (7 points / 8 assists). As you can see by the numbers, contributions are coming from everyone and that’s the definition of teamwork. The ASU offense shot 46.9% from the floor (30-64) and the Sun Devil defense held UCLA to a below average 34.7% shooting percentage. As a result, the Sun Devils held the lead for the majority of the game, and hit some crucial free throws at the end to seal the victory. The other major factor on Saturday was the Sun Devils effort on the glass, as they out rebounded UCLA (52-33). Finally, the game couldn’t have ended more perfectly. With a few seconds left on the clock and the victory secured for ASU, UCLA tried to get a few last second meaningless points on an unexpected steal and fast break. Carrick Felix decided that wasn’t going to happen in his house, so he sprinted the entire length of the court and blocked the shot from behind. It might have been cold and rainy outside today, but the sun was shining brightly Wells Fargo Arena. HARDCOURT REPORT: Devils fall to Cats in Tempe, 71-54.